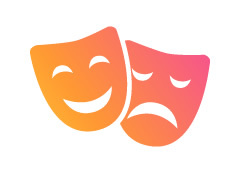 Two male actors needed for small roles in new comedy play in SE London on April 28th and 29th. Beginners welcome but must be confident performers. Sadly no pay, but food on performance days and comp ticket. rehearsals to be confirmed February to April (weekends and evenings). Performance on April 28th and 29th. Gangster/hardman type. Slim or muscular build. Tattoos ok. Any ethnicity.A small but fun role as a hardman setting up a couple of gullible men for a robbery. Conservative estate agent, but is cheeky with a bit of swagger. A small role that ends the play. Three Actors Required for Lead Roles in Short Film - "Mixtape"
Big Brother is Coming to Get You!